Home of the "Air Perm"
Industry leaders in the field of permanent waves and healthy hair. 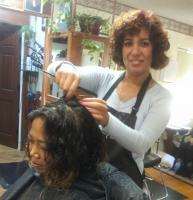 I'm a very passionate hairstylist and truly enjoy seeing the satisfied look on my clients faces. I'm committed to offer them a great experience through service and education on the best care for their hair! Thursdays are Senior Days! 20% discount on any Service! For my frequent Clients: 1 Free hair or scalp treatment with any five services! Air Perm Professional moves to Tennessee! "We believe the ultimate test of truth is results"